NASA, through its Earth Science Data Systems, supports the NASA Earth Science research community in providing Earth science data products and services driven by NASA’s Earth Science goals. NASA’s Earth Science Program is dedicated to advancing Earth remote sensing and pioneering the scientific use of satellite measurements to improve human understanding of our home planet in order to inform economic and policy decisions and improve operational services of benefit to the Nation. Through the Making Earth Science Data Records for Use in Research Environments (MEaSUREs) Program, NASA is continuing its commitment to expand understanding the Earth system using consistent records. 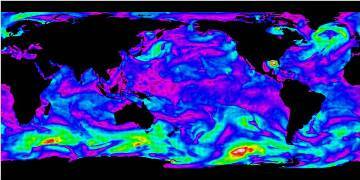 NASA has begun to deploy new types of sensors to provide three-dimensional profiles of Earth’s atmosphere and surface. Emphasis is placed into linking together multiple satellites into a constellation, developing the means of utilizing a multitude of data sources to form coherent time series, and facilitating the use of extensive data in the development of comprehensive Earth system models. The Changes in Earth Masses (GRACE) MEaSUREs project generates accurate, easy-to-use data products that measure exchanges in Earth masses among the various reservoirs (oceans, land, ice). The latest corrections are applied. The Integrated Multi-Mission Ocean Altimeter Data for Climate Research has developed a coherent and consistent time series of sea surface height from multi-mission altimeter data that meets the most stringent accuracy requirements demanded to provide credible mean sea level estimates for climate research. This results in a single time series of Sea Level Anomalies (SLA) for satellites on the same orbit. It is currently available for the TOPEX/Poseidon, Jason-1 and OSTM/Jason-2 series. The Cross-Calibrated Multi-Platform (CCMP) Ocean Surface Wind Vector Analyses provide a consistent, gap-free time-series of ocean surface wind vector data. The CCMP datasets combine cross-calibrated satellite winds obtained from Remote Sensing Systems (REMSS) using a Variational Analysis Method (VAM) to produce a high-resolution (0.25 degree) gridded analysis. The CCMP dataset includes cross-calibrated satellite winds derived from SSM/I, SSMIS, AMSR-E, TRMM TMI, QuikSCAT, SeaWinds, WindSat and other satellite instruments as they become available from REMSS. 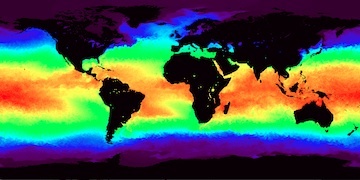 The Multi-scale Ultra-high Resolution (MUR) sea surface temperature (SST) analysis is a consistent time series of global SST gridded at 1 km resolution. It is a blend of infrared (IR) sensor data from MODIS and AVHRR and microwave (MW) data from AMSR-E and WindSAT with in-situ data used only as a low-resolution reference for inter-sensor bias adjustment. To merge satellite measurements with drastically different spatial resolution and coverage, a wavelet-based, multi-resolution analysis technique is employed to ensure consistency of the SST analysis.